Editor’s Note: The hyperlink to the study goes to an archived webpage because the full text version is no longer available on the JAMA website. A recent study published in the Journal of the American Medical Association (JAMA) that is widely touted to argue against the measles, mumps, rubella (MMR) vaccine’s association with autism actually provides evidence for a connection. Based on computation from the study results for participants with non-autism spectrum disorder-diagnosed (non-ASD) older siblings, children who received a dose of the MMR vaccine before age five had a risk for ASD diagnosis by age five that was 48% higher than in children who did not in analyses that corrected for certain potential biases. Where both groups received a dose of MMR vaccine – one largely before the bulk of autism diagnoses were made and one following it – the comparison is less likely to suffer from bias that might affect those involving children never vaccinated with MMR or those who received both recommended doses. Parents might be discouraged from giving a child a second dose of MMR or MMR at all if a child had a negative reaction to the first dose or to a dose of a different vaccine. Similarly, parents of children with autism may be more likely to take seriously concerns about vaccinations’ association with autism and more likely to withhold vaccines from their children. These potential biases make studying the timing of MMR vaccination in relation to autism preferable, though the authors of this study did not bother to do this. Nonetheless, the complete data sets from the study are needed to confirm whether the aforementioned association holds when controlling for other variables. Yet the crude findings are similar to results from a study conducted by the Centers for Disease Control and Prevention (CDC) that was published in the medical journal Pediatrics in 2004 and has also been cited to deny autism’s association with MMR. Those findings showed an odds of earlier MMR vaccination that was more than two-fold higher among African-American children with autism spectrum disorders compared to their non-ASD counterparts of the same race. According to study coauthor William Thompson who has come forward as a federal whistleblower, that finding was omitted from the published manuscript in breach of final study protocol. Pediatrics has refused to consider the paper for retraction, even though it should be considered according to the guidelines in publishing ethics that the journal claims to follow. Now what CDC researchers found more than a decade ago seems to only be confirmed by the results of this much larger study published in JAMA. The troubling history of epidemiological studies used to disprove the MMR causes autism despite finding associations predates even the CDC study. A 2002 study published in the New England Journal of Medicine (NEJM) and even larger than the recent JAMA study yielded results from which a 45% increased risk for autism associated with MMR vaccination was computed, despite concluding no connection. The scientist who computed that risk explained why the association was potentially meaningful in a letter to the journal, but the journal never published it. The principle investigator Poul Thorsen (who also found but did not publish results implicating mercury in vaccines in causing autism) of the NEJM study has since become a most-wanted international fugitive who was indicted on fraud charges. Even after his indictment in 2011, the Institute of Medicine (IOM) included his study as one of just four to support the IOM’s position that MMR vaccination does not cause autism. Another IOM-cited study published in the Lancet in 1999 showed a relationship between timing of MMR vaccination and parental concern of child development in a sample of children with autism, according to a slide from an IOM-commissioned epidemiological review. As the studies used to disprove an association between MMR and autism continue to mount, so too does the evidence favoring a causal relationship. 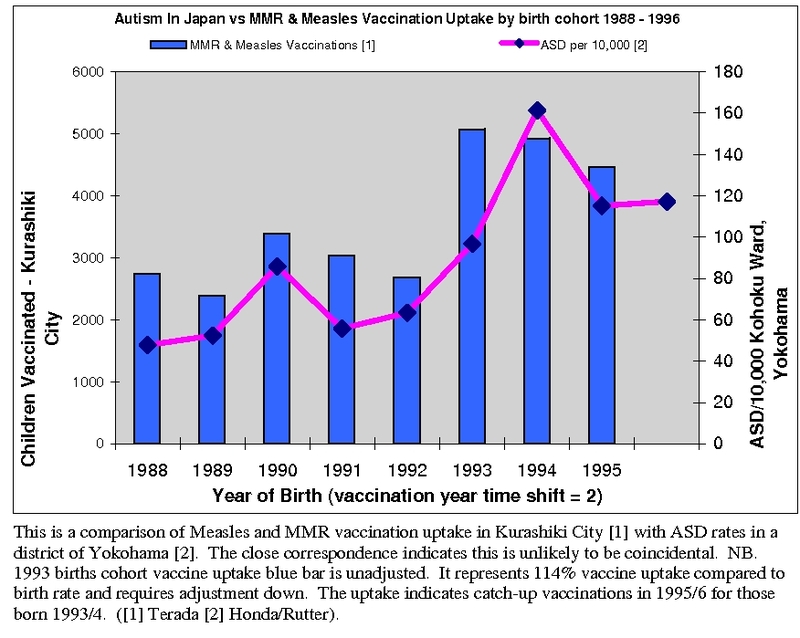 A study in the Journal of Child Psychology and Psychiatry claiming autism rose as MMR was removed from use in Japan neglected the fact that the rise was correlated to single measles and rubella vaccines routinely given just four weeks apart. Another study published in JAMA in 2001 claimed that MMR vaccination coverage in California rose marginally while autism occurrence exploded, only for other scientists to then point out that the coverage of MMR vaccination given at younger ages also exploded. How ironic that studies he cited to say there is no link actually found a link, and then his own study would later find the same. Correction: More information concerning the study results has since come to the attention of Autism Investigated, including the realization that some of the content originally in this post was not accurate. The article has since been updated. Irony , you have got to love that irony . The studies that CONCLUDE vaccines dont cause , ARE upon further scrutiny finding that in fact vaccines are the cause of Autism . Come on Craig Newschaffer – care to make a comment here ? Excuse me , pharma trolls , but LOL here , big old belly laugh , even though the subject is so serious . What I find so weird is how JAMA was promoting this study with videos within the first weeks of its publication, then suddenly makes the full manuscript, tables and references unavailable through open access while still leaving the videos up. JAMA wants everyone to know of this study’s existence and conclusion, but little more than that. So, Jake, when can we expect to see this rigorous analysis that you have performed published in a peer-reviewed journal? If not, why should we take you seriously? Regardless, this is using data from the study itself. So if you’re not going to take me seriously, then you shouldn’t take the study results seriously either. The question is regarding your ANALYSIS of that data that you did to form your own conclusion. Until other experts have examined it, and concluded that the statistical methods were appropriate, all we have is your ‘belief’. No, because I actually link to my calculation within this post. Nobody is stopping you from getting another expert’s opinion on it. Jake, do you know if the studies that Poul Thorsen co-authored were ever subject to scrutiny? Just to clarify – I meant the same kind of scrutiny as Wakefield’s work. No, they weren’t. If they received that level of scrutiny, they’d all be retracted. Pls, could you post your analysis / data computation on pubpeer? There are too few comments on epidemio studies, people still think these studies are “real deal”. Thanks for the links, will definitely look into it. The issue of a (potentially) mandatory adult vaccination program is ultimately the white elephant in the room. If those who are pro-vaccine are not going to appear hypocritical with regard to attaining the oft-repeated Herd Immunity 95+% figure, then it is surely required that everyone, inclusive of adult populations, be vaccinated. Yet I think this is their Achilles heel. From what I’ve seen, a large percentage of those pro-vaccine are basically eugenicist types; social-Darwinists in their mentality. If the needle were pointed back at them I very much doubt that they would feel quite so obliging. Even when vaccines aren’t mandated or for adults, there is still so much of that hypocrisy. A good example is Tony Blair not stating whether his son Leo had the MMR while pushing it for everyone else. Well yes, and in my opinion Blair exemplifies the eugenicist-type. Speaking of political leaders, this may be a very naive question, but do you think it conceivable – given that the 2004 CDC studies as outlined by Dr Thompson involved African-American boys – that Obama himself might feel personally motivated in seeing the issue reach congress? …I ask this simply because despite that the Obama administration may as a whole be inextricably linked with the pharmaceuticals companies, one might nonetheless imagine that Obama may feel very taken aback at the notion that his own people have, yet again, been treated with contempt and consequently put in harm’s way? I fear you’re right. So perhaps this whole situation has simply to play itself out. I’ve much appreciated your time here Jake, and won’t waste any more of it. I think you’re doing a splendid job and that all is not lost with the few brilliant and courageous people like you battling it out head-to-head. I understand that you’ve felt disillusioned – if that’s the right term – by Wakefield lately, but if I may say I think that, despite whatever faults he may have, he seems, given the circumstances, a decent man overall (I’ve never in my life witnessed such insidious behaviour en-masse than towards this man, how would anybody feel in his shoes?) and is very persuasive in manner. People will listen to him more and more. ‘Wo aber Gefahr ist, wächst. (‘But where danger is, grows. PS: The quoted lines are by the profoundly unscientific 18th-19th century mystical poet, Friedrich Holderlin. Your analysis appears to be based on a misinterpretation of the data. Because Table 2 shows a total of 90 cases of ASD among those unvaccinated at age 4, and a total of 79 at age 5, you erroneously conclude that there were only 11 (90-79) ASD cases among those first vaccinated after age four but before age five. But the 90 only includes those diagnosed with ASD by age 4, whereas the 79 also includes new diagnoses that occurred between ages 4 and 5, so your 11 is an underestimate (indeed, your reasoning would imply a negative number of cases among those first vaccinated between 3 and 4 y). This underestimate would explain your erroneous conclusion about relative risks. No, your reply does not address the issue. You calculate the supposedly lower risk for those first vaccinated between ages four and five as 11 / 4340. Where do you get 11? Apparently you subtract 79 from 90, as though they were both numbers of cases diagnosed *by age four*. In fact 79 is the number diagnosed *by age five* in the subset, so your calculation is invalid. The number diagnosed by age four would have been lower. If it was, say, 60, which is consistent with the age distribution of diagnosis in the study, that would mean that there were 30 cases, not 11, and your supposed factor of two disappears. Okay, I see where you’re coming from now. I was going by cases that could be directly enumerated from crude calculations from the table. I acknowledged the complete data sets were needed to resolve the issue. It is not a matter of having a crude approximation. There is absolutely no basis for your claim that “JAMA Study Implicates Early MMR Vaccine in Causing Autism”. As you acknowldege, the lower rate of ASD that you claimed for those vaccinated between ages 4 and 5 is an underestimate of the actual rate. In fact, as I explained, we expect it to underestimate the rate by more than a factor of two. So, the claim that this group has a more than two-fold lower rate of ASD is completely baseless. You have a responsibility to remove this claim and to post a correction that is as prominent as the original unfounded claim. It appears that you acknowledge that the original claim was unfounded, but are now claiming a 48% difference between a different pair of groups. How did you arrive at this figure? What I expected to be a link to your computation instead goes to the supplementary information for the JAMA article. You mean you just went to that table and picked the highest number? Even though that number was only corrected for some effects, and correcting for others brings it to approximately 1 (no difference)? Even though it lacks the obviously critical adjustments described in note (c) of Table 2? And you ignore the other column of eTable 3, which, by your reasoning, would mean that vaccination protects against ASD in those with older siblings with ASD? I picked the number I thought corrected for bias on the safest assumptions. Non-differential misclassification is always biased towards the null, but differential can go either way. I also acknowledged the need to adjust for potential confounding variables. I did not ignore the other column because I was specific about which group the association was found in. There is obviously huge potential for impact of parental biases in the older ASD sibling group. You decided on logical grounds, rather than by looking at the numbers, that that particular figure was the right one to look at? Your supposed 48% increase can obviously be explained as an artifact of differential outcome misclassification. You say that you “acknowledged the need to adjust for potential confounding variables”, but that hasn’t stopped you from using the unadjusted number to claim that the study implicates the vaccine in causing autism. That flawed claim is your headline, whereas the “acknowledgedment” comes late and will hardly be noticed by most readers. You were happy to include the group with older ASD siblings in your first, flawed analysis, when it seemed to support your conclusion. Where, as in eTable 3, vaccinees would appear to have lower risk, you invoke parental bias to ignore this group. What if the numbers in the two columns of eTable 3 had been reversed? Would you still have dismissed the second column on the grounds of parental bias? No, let’s face it: you would have claimed that it implicated the vaccine in causing autism, and kept your headline and post pretty much the same. You are obviously trying hard to reach a particular conclusion, one that is not supported by the data. The authors’ figures assumed differential would only bias away from the null, and it doesn’t. Even if it did bias away from the null, the extent applied to those scenarios are entirely assumed by the authors. There is such a need, but that particular finding is still implicative of a connection. Well no because MMR does not prevent autism, so a decreased association would have to be due to some sort of bias. In other words, you look at a lot of different numbers — different comparisons, different combinations of corrections and adjustments — and any that are less than 1 you dismiss as bias, but any that are greater than 1 you point to as demonstrating that the vaccine causes autism. And you are happy to apply any corrections that move the estimate away from the null, but you reject all corrections that move it toward the null, because, well, you want to reject the null. I was going by figures where corrections were made based on actual data, not scenarios applied by the authors, and where the association was likely to represent a real relationship between exposure and outcome as opposed to bias caused by parental decision making. Actually, your new claim is unfounded for another reason. The 1.48 relative risk that you base it on is not statistically significant. How do I know? Because the uncorrected value on which it was based is not statistically significant, and correcting for non-differential misclassification does not decrease the p-value (the confidence interval for the raw estimate of 1.16 includes values less than 1, and these become even smaller with the correction). See, for example, http://aje.oxfordjournals.org/content/164/1/63.full.pdf . Thus, there is no basis for the claim that “JAMA Study Implicates Early MMR Vaccine in Causing Autism”, and you should remove it, and post a correction. that IN error in a binary measure X of a binary T reduces the power of tests for the association of T with an outcome Y, and it induces a bias toward the null in common 2 3 2 table association measures (1, 2), apart from a few special cases in which no bias occurs (3).” -MMR being the binary exposure and ASD diagnosis being the binary outcome. So the corrected RR estimate will have the same distribution of values where the probability of getting a different value due to chance is less than 95%, and the RR estimate is high enough that those values will not include 1. The necessary correction has already been made. No, it is definetely not statistically significant. I understand exactly how the non-differntial misclassification correction works, and I can assure you of this. The paper to which I provided a link is about precisely this type of case. Its title “Accounting for Independent Nondifferential Misclassification Does Not Increase Certainty that an Observed Association Is in the Correct Direction”, summarizes the relevant point. The uncorrected number, 1.16, is not statistically significant, and corrections for non-differential misclassification do not increase our certainty that it is greater than 1, that is, it remains statistically non-significant. As they say, “statistical adjustment for misclassification does not reduce the p value even though the adjusted point estimate moves away from the null”. In other words, that 1.48 that you like is no more statistically significant than the uncorrected 1.16. This is easy to see if you think about it. This correction always moves numbers away from 1. We don’t know that the uncorrected ratio is greater than 1, so we don’t know that the corrected ratio is greater than 1. If the true uncorrected ratio is 1 (or lower), then the true corrected ratio is 1 (or lower), and the confidence interval allows this possibility. Of course non-differential misclassification reduces power. That’s the point, really. Correcting for non-differential misclassification does not magically restore this lost power. It is not clear what that statement in the supplementary information is intended to mean, but it doesn’t matter. Whatever they are trying to say, it is a fact that the confidence interval for 1.48 necessarily includes 1. If you still don’t see it, I’m sure you have access to a good statistician who can clarify it. Meanwhile, the claim in your headline rests on a number that is not statistically significant, so it is baseless and should be removed. The authors are saying the confidence interval carries the same imprecision as the one for the uncorrected estimate, meaning that the distribution of values that define the confidence limits are the same around the point estimate. So by the authors’ logic, the confidence limits around the corrected estimate do not include 1, and you’re saying what they said is wrong. So either you’re wrong, or what the authors said was wrong. It is not clear what the authors are trying to say. If they meant what you suggest, then they are simply wrong, without question. * If adjusted frequencies are rounded off. No, your calculation is incorrect. It makes exactly the error that that paper warns against. It in effect ignores the fact that, as you recognize, misclassification reduces power. You have calculated what the confidence interval would be in the absence of misclassification if a 1.48 ratio had actually been observed. A correct confidence interval would be obtained by applying the correction to the end-points of the uncorrected confidence interval. Since the uncorrected confidence interval includes values less than one, the corrected confidence interval contains values even lower than one. I despair of convincing you of this since you are strongly motivated not to see it. Again, I suggest speaking to a statistician. The fact remains that this result is not statistically significant, and your big claim is unfounded. That supports my original point – rather than finding a true non-association, the results could have also been due to a misclassification bias that masked a positive association as the authors acknowledge. Using math to combat science has a certain pang of disgust that only the thinking mind can comprehend. I think Yogi Berra was referring to people who are too obsessed with baseball stats to enjoy the game of baseball. You can’t really get away from stats, however, when involved in epidemiological research…or in lying about it. Pingback: Turncoat Simon Murch Defended Vaccines Months Before "Retraction"